Wen began her de Souza Nurse Associate Designation when she felt there was a gap in the amount of emotional care she was able to readily provide to her patients. Seeking out new educational opportunities is how she discovered the de Souza Designation program. According to Wen, the designation program helped her learn and grow as a nurse in many aspects. She believes it has enriched both her professional and personal life. Wen viewed the designation as a great way to keep her knowledge current and would validate her competence in her area of clinical practice. In 2010, Wen received her Canadian Nurses Association certification in Medical-Surgical Nursing. 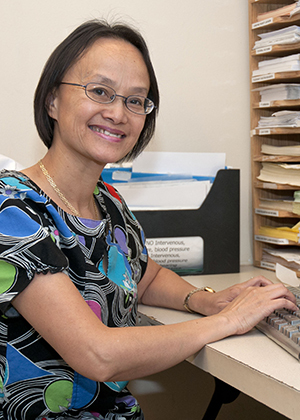 Now Wen works as a Care Leader at Toronto General Hospital in the surgical oncology unit. Having seen many patients with cancer and other chronic issues, she believes that staff should continually maintain and enhance their knowledge, skills, attitude and judgment to improve the quality of patient care and patient services.